Enjoy yourself in Osado’s deep green playground! 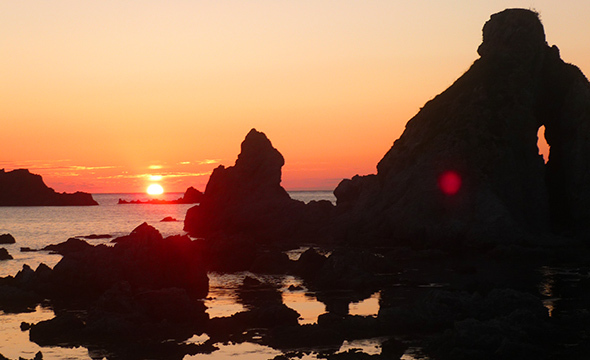 The 38th latitude, parallel north, which is a boundary line to separate warm-temperate and cold-temperate floristic zones, passes through the middle of Sado Island. Therefore, over 1,700 species of both northern and southern breeds grow naturally. 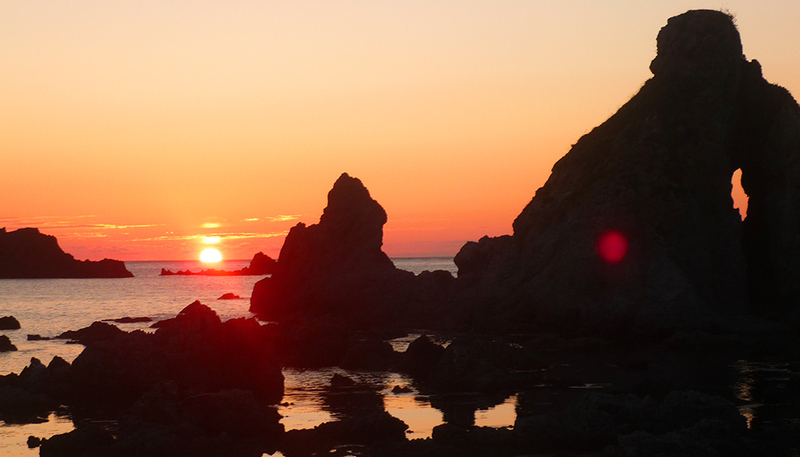 Due to the warm current flowing off the coast of the island, Sado actually has cooler summers and warmer winters than mainland Niigata. This natural environment, combined with the blessings of both the sea and the soil, make Sado an island with interesting features in terms of botany. You can find gregarious wild plants,normally found only at over 2,000 metres above sea level on the mainland, at below 1,000 metres. 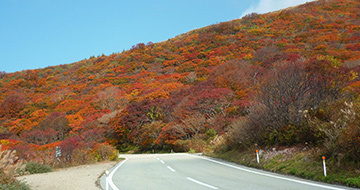 Temperate plants such as loquats and beeches grow in the southern part of the island, and frigid plants, including Japanese red pine and oak trees in the north. 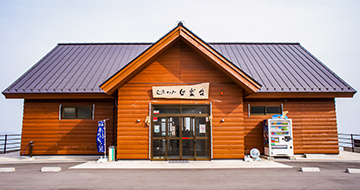 With such a unique ecosystem, Sado is indeed a microcosm of Japan. The mountainous area called Osado, in particular, offers great landscapes and diverse nature. 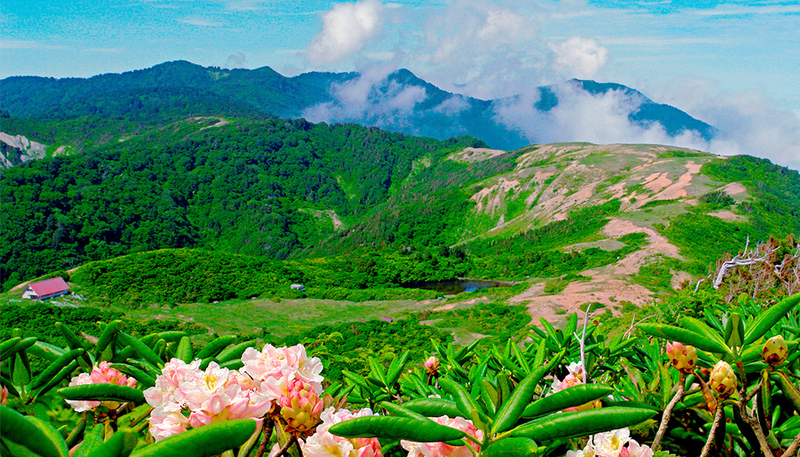 Rare varieties of wild plants and alpine plants grow naturally, and that makes Osado a popular visitor attraction. Trails vary, from gentle hiking routes suitable for beginners to intense courses for experienced traversers. Come visit Sado and experience the nature of Osado! Lush with beautiful wild plants, Mt. 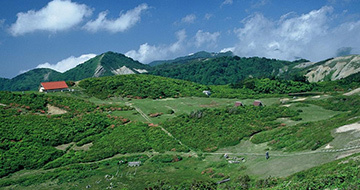 Donden is popular among hikers. The mountains of the Osado Range are a great source of pleasure to us in both spring and summer. 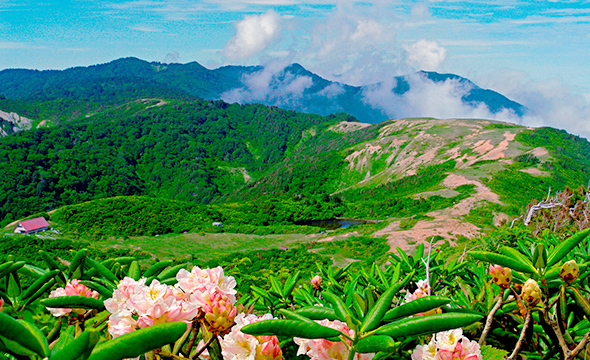 Wild plant hunting hikes and summer mountaineering are fun, but how about making a detour and discovering the other charms that Osado has to offer? 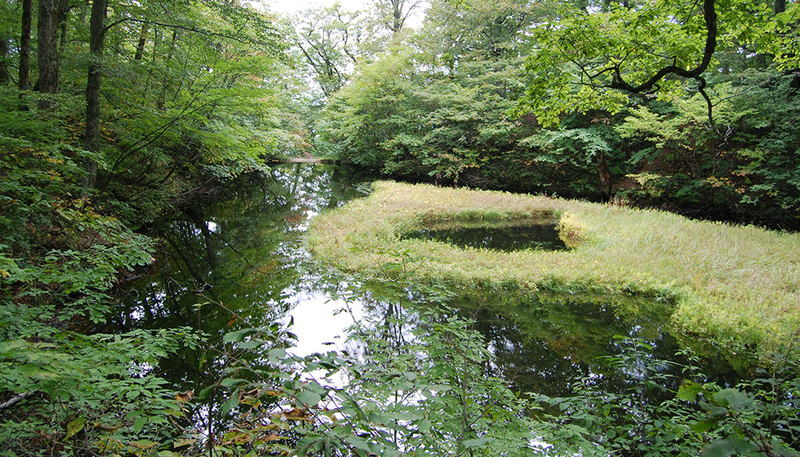 Situated in the middle of Osado Skyline, Otowaike Pond has a floating bog in the middle, one of the largest of its kind in Japan. 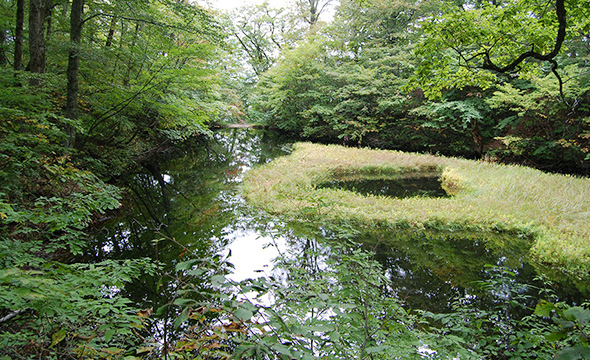 The pond is encased in green clusters of over 200 varieties of plants and has a mysterious atmosphere. 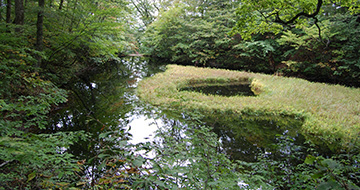 The name of the pond is derived from local lore, which invloves a young woman named Otowa and a gigantic serpent. Also recommended is a night drive on Osado Skyline or Mt. Donden to enjoy the evening breeze. The horizon turns orange at twilight and the starry night skies after sunset will leave you with fond memories of Sado! 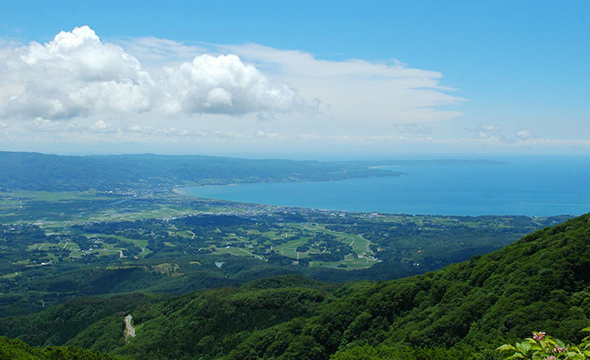 Hakuundai on Osado Skyline, located at 850 metres above sea level, provides one of the best viewing spots. The shape of the island appears clearly in the dark, and you can enjoy a spectacular panoramic night view over the Kuninaka Plains. Please drive safely on Osado Skyline and the roads leading to Mt. Donden, as there are few lights, many curves and steep hills. 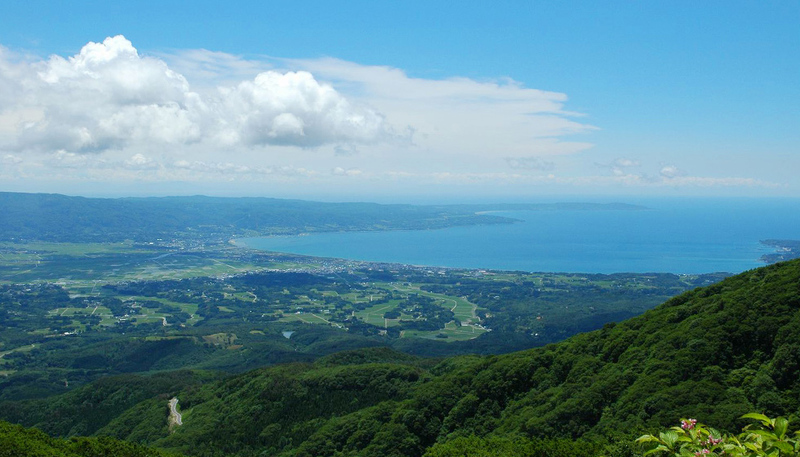 You can look out over the Kuninaka Plains and see the Ogi Peninsula. Related spots can be found below. Clouds and fog form throughout the year in the Osado mountains. 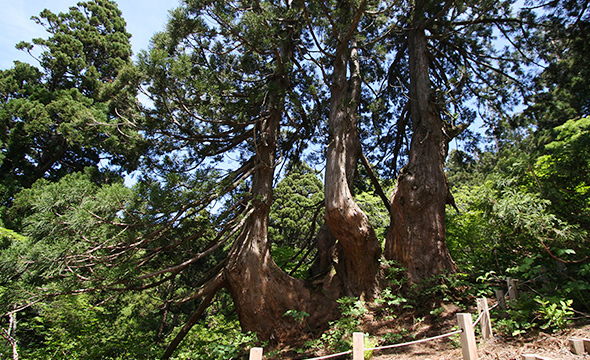 With snowfall and severe seasonal winds from late autumn until early spring, natural cedar trees develop even in this hostile environment. 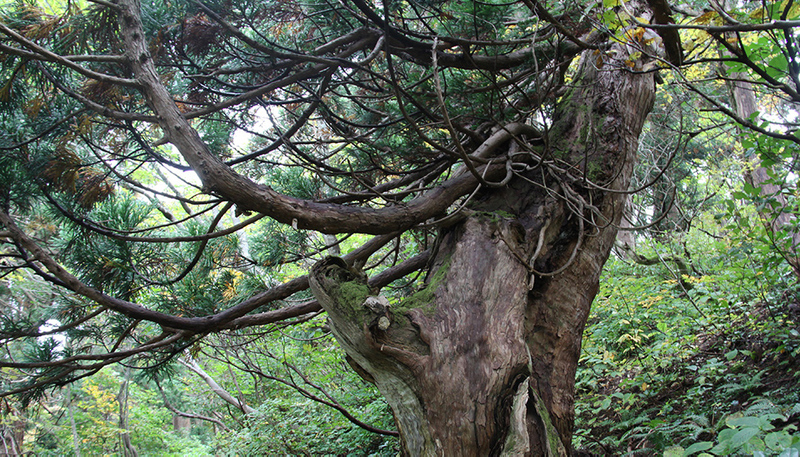 Such extreme conditions have turned cedar trees on Sado into natural masterpieces. Interestingly formed cedar trees stand in the pristine forests of Osado with an otherworldly atmosphere. 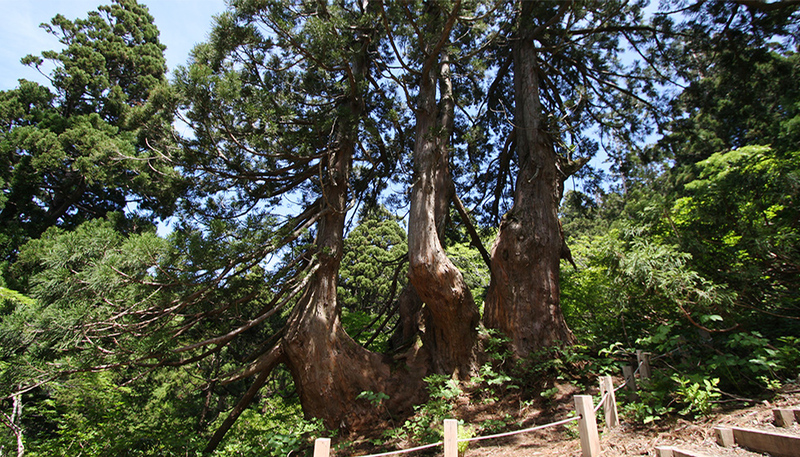 These Sado-born trees include the giant Senju (one thousand hands) cedar tree and the Kongo cedar tree, which became well-known at the time of the Hokkaido Toyako Summit in 2008, where their photos were displayed in an exhibit. 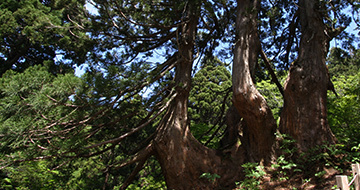 The “Osado Ishina Natural Cedar Forest Walk” track between Waki and Ishina opens to the public in the period from early summer to autumn, and you can see many cedar trees with distinctive features, including the Shitenno (four heavenly kings), a cedar tree that has four trunks, and the Zoge (ivory) cedar tree with huge branches which look like ivory. The 1-hour trail is comparatively mild. There is a resting point with a view, so it is perfect for a family day out, too. Immerse yourself in pristine cedar trees, and refresh both your mind and body in the cool air away from summer heat! 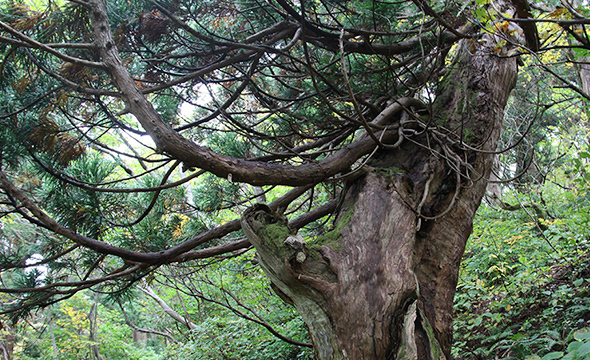 The harsh environment in Osado has turned these cedar trees into masterpieces.